Gold N Grand, the premiere all breed horse in Northern California, kicks-off tomorrow, Friday, March 28th, and runs through the weekend at the Murieta Equestrian Center in Rancho Murieta. Â Gold N Grand features a myriad of different classes including Pleasure, English, Leadline, Halter, Trail, and Reining.Â Over 350 buckles will be handed out over the three day event for 1stÂ through 5th place finishes in both three-day point accumulation and day awards.Â There will also be nine high-point western saddle awards in youth, amateur, open, and reigning groupings. High Point Western Saddles. 9 will be awarded at the spring Gold N Grand. The show is approved by the Pacific Coast Quarter Horse Association, AQHA Special Event, APHA for Paint Alternative Competition, and the West Coast Reigning Horse Association. There is also action outside the show arena.Â There will be many vendors selling tack, show clothes, equipment and food.Â For those showing, Murieta tries to make the event feel like home with bounce houses for the kids, barn parties and pancake breakfasts. It appears that there is a good chance the show will see rain on Friday and Saturday but should be clear on Sunday.Â This will only affect the outside arenas. Here is the revised schedule release on Tuesday. 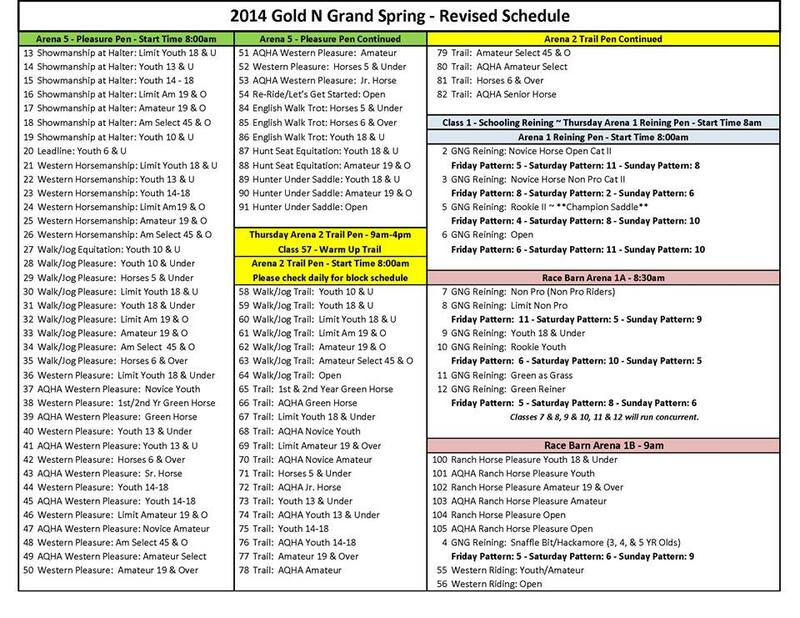 This, the “Spring” Gold N Grand, is the first of two of the big horse shows for the year. Â Gold N Grand Summer will also take place at the Murieta Equestrian Center in August. Riders lineup for the class awards at a previous Gold N Grand.